The key to a dry basement starts at ground level. A properly drained yard will keep your basement moisture free all year round. Often, grading around the house will eliminate the problems with a wet basement. 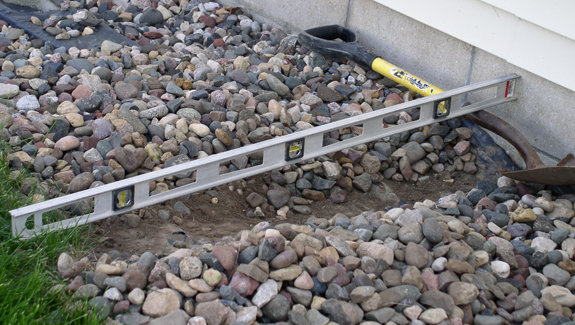 Elements such as retaining walls, patios, and edging can also be added to further reduce the chance of water seeping into the foundation of your home. At Groundworks, we specialize in correcting poorly drained landscapes. We use the proper equipment to determine the source of the water problem — whether it's from surface water, subsurface groundwater, underground springs, or storm water — and plan a course of action to correct the drainage issue. A drainage plan is integrated into all our designs to insure long-lasting landscapes and hardscapes that will withstand any extreme weather changes. M–Sat: 8 a.m. to 8 p.m. Copyright © 2019, Groundworks, Inc.